Mindfulness is a term that is being thrown around a LOT these days. We hear the phrases “Be Present”, “Be Mindful”, and “Meditate” on a regular basis. Generally speaking, I consider myself to have a reasonable understanding of the importance of mindfulness and how it contributes to one’s overall quality of life. But, I wanted to know more. I have been looking to expand my meditation practice, and wanted to have a better understanding of how to implement mindfulness in my life. I was noticing that the more stressful my life became, the harder it was to turn off my thoughts. So, I figured it was time to explore what mindfulness REALLY is. I enrolled in a Mindfulness Awareness Practice class through the UCLA MARC program. This is a research center that focuses specifically on studying mindfulness. Eventually, I’d like to be able to instruct others on how to use mindfulness in their daily lives, but until then, I have many questions that need answering. I decided to write this blog in two parts. This first is Mindfulness Basics, and in the next post, I will go a little more in depth of how to actually begin to change some thinking patterns. When we find ourselves in a stressful situation, our animal instinct activates a part of our brain called the amygdala, which triggers our “fight or flight” survival mechanism. This was helpful when we were hunters and gatherers, needing to protect ourselves from prey, but now it’s a reaction that can cause us great and unnecessary anxiety, fear, and other stressful feelings. When we use mindfulness to bring us to the present moment, we are activating the prefrontal cortex of our brains. This lessens the attention in the amygdala, and creates calmness, compassion, and space in our emotional body. Mindfulness is about more than meditating. 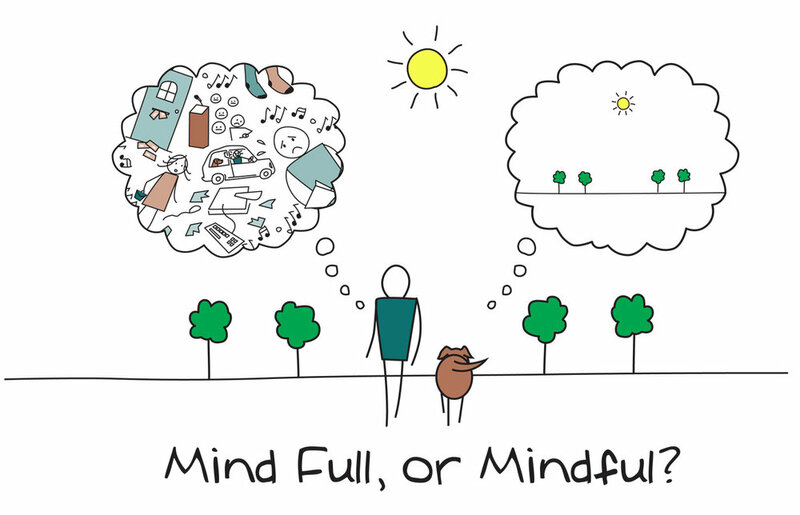 Here are some ways to notice and start to practice mindfulness in your everyday life. Being conscious of where food comes from, how it tastes, how it feels in our mouth, and how much our body actually needs at one sitting. Taking time to slow down and appreciate each bite is something we rarely practice, but can have major benefits to our overall health. Having conversations where we’re actually focused on what the other person is saying, and not what we’re going to say in response. It’s about putting our attention on the other person, not on distracted thoughts or our every-present tech devices. Doing our best not to judge ourselves about how we feel and look. Acknowledging how memories of past incidents might still be affecting us physically and emotionally, and how releasing our attachment to those memories can bring us a different perspective. Mindfulness is a skill that can be developed, just like anything else, but it does take effort. We learn to celebrate the little victories, such as appreciating the natural beauty of a flower, slowing down to help others around us, and sitting quietly each day in stillness. We can apply the principles of mindfulness to our relationships with ourselves, with our loved ones, and with strangers, alike. The idea is that if we allow ourselves to be aware in each moment, we can start to release expectations and develop compassion for our fellow humans. And, yes, it works. The more aware I am of my actions and interactions throughout the day, the more gratitude I have for everyone and everything around me.